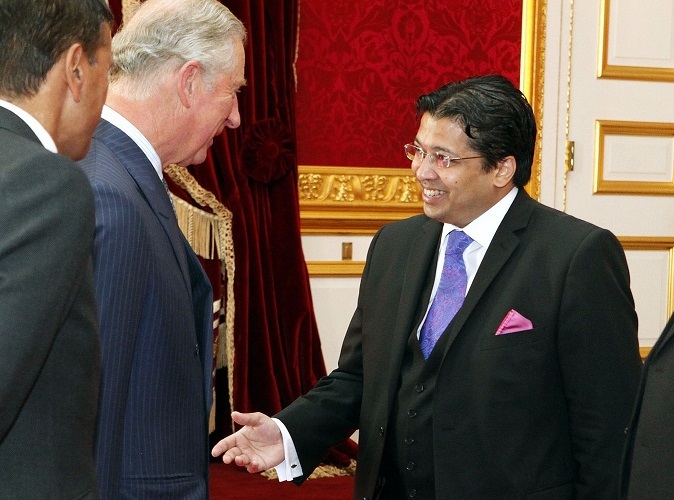 ‚ Prince Charles hosted a reception at St James’s Palace for members of Britain’s Sri Lankan and Indian communities to mark the royal couple’s tour of India and Sri Lanka. The guests at the event included prominent British Asians from a variety of sectors. Amongst the Sri Lankan guests were Niranjan Deva-Aditya, MEP,‚ Member of the European Parliament;‚ Professor Sir Arulkumaran Sabaratnam, FRCS,FRCOG, President of the British Medical Association; Professor Ravi Silva, Professor of Engineering, Surrey University; Harendra De Silva, Q.C. President, Sri Lankan Lawyers Association; Councillor Nizam Ismail;‚ Sir Desmond De Silva QC, PC; Suran Goonetileke, OBE. HRH Prince Charles last visited India to represent ‚ Her Majesty the Queen at the Commonwealth Games in 2010, and he has visited Sri Lanka on two previous occasions, in 1998 at the celebration of Sri Lanka-â„¢s Independence, and in 2005, a few months following the Tsunami. On this occasion, Their Royal Highnesses Prince Charles and Duchess Camilla will arrive in Sri Lanka on the 14th November, on Prince Charles-â„¢ 65th Birthday. The Heir to the throne will represent Her Majesty the Queen at the Commonwealth Heads of Government Meeting (CHOGM 2013), which commences on the 15th November. Dr Chris Nonis added, -HRH has a strong interest in charitable work, and two of his charities are already working in Sri Lanka on youth entrepreneurship and sustainable development projects, and the CHOGM theme -Growth with Equity; Inclusive Development- has a particular relevance-. This entry was posted on Thursday, November 7th, 2013. You can follow any responses to this entry through the RSS 2.0 feed. You can skip to the end and leave a response.